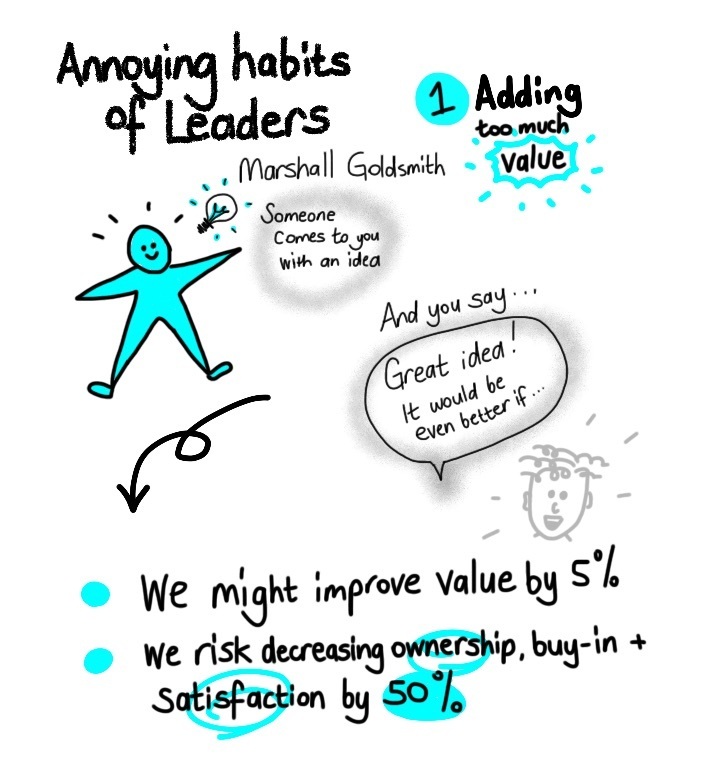 ‘Adding Value’ – an annoying habit of leaders! Many people leaders started out their careers as ‘technical’ or ‘professional experts’, ie we were paid for being really good at something or for knowing a great deal about something of value. Our core purpose was as an individual contributor. When we become leaders of others, the skills and capabilities that helped us to be successful in the roles as an individual contributor are different to those needed be a successful leader. It takes a mindset shift, and may require letting go of some of the things that made us successful in the past – and were key to our ‘identity’. We must shift from ‘doing the work’ to getting the work done through others. So…there is a chance that some of our old habits will still be around. Does this sound like you? When someone comes with an idea or a report, do you feel the need to ‘add value’? We need to be careful who we are doing that for. This can be a delicate thing to balance. The answer to the question above might be – for them – as we are helping to coach and develop our people. That is great – and an essential role of a leader. Or it might be because our ultimate accountability means we need to make sure it is ‘just right’. Or it might just be an unconscious habit. All we suggest is that the next time you are faced with reviewing a report or presentation or something similar from one of your team members, stop and think about what is happening and – think about how you go about that. What is driving the need to offer suggestions (or ‘add value’)? Is there a risk you might inadvertently have a negative impact on ownership, buy-in or satisfaction that is greater than the ‘value’ added? How are you going about providing feedback? Source : This concept of the unintended consequence of ‘adding value’ comes from a video featuring Marshall Goldsmith. Click here if you want to watch it. This is a great video but it is also quite long – so if you wish to jump straight to the piece about ‘annoying habits of leaders’ – in particular the piece about ‘adding value’ – start at 9mins. Want to see another blog on a similar topic? ← GROW – with 5 questions?